Jason Fried says in his book Rework that in Basecamp, company in which he is co-founder and CEO, one of the abilities that they are interested in when hiring people is their writing ability, no matter if they are sales people, programmers, or designers. The reason is simple: Clear writing is a sign of clear thinking. Good writers know how to communicate, they make things easy to understand and they know when to leave out the unnecessary. You will communicate with clarity. Unlike talking, when you write you look for more sophisticated words and expressions to describe what you have in mind. This helps you build a structure that will allow you to express yourself better and communicate complex ideas in a much more effective way. You will eliminate stress. In the same way as in GTD you empty your mind—by capturing everything that comes to it—in order to eliminate the stress that causes having many things hitting your head, writing and developing your ideas produces an amplified effect since not only you take them out of your mind but also the whole process of rationalization that otherwise would abstractly stay in there. You will be more productive. 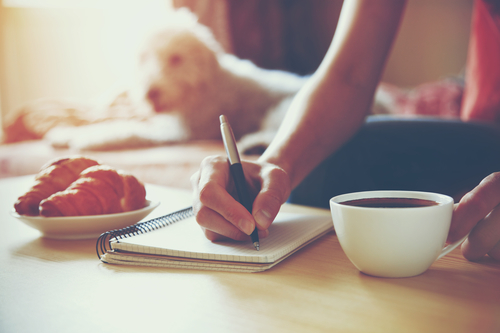 Writing activates the neurons in your brain and gets it ready to overcome the rest of the tasks (you can use it as a kind of warm-up at the beginning of the day). In addition, writing down your tasks with the appropriate words prepares you to carry them out properly. Finally, it’s demonstrated that setting your goals in writing increases significantly the possibilities of achieving them. You will learn more. Writing in your own words the information that you receive helps you assimilating and consolidating knowledge that otherwise you would forget soon. You will gain awareness of your reality. If you write down what you have in mind each day, what you expect to achieve and how you feel according to this, you won’t need a psychologist to explain you who you are. You will realize yourself. You will make better decisions. When writing you clear up your thoughts and, obviously, a clearer thinking allows you to make better choices. You will be happier. It’s an immediate consequence of the two previous points. There is no need to write a public blog, a sort of personal journal is perfectly valid. You will live more focused. If you constantly write about your thoughts you will never get out of sight what you want to achieve, which your dreams are. You will overcome tough moments faster. There is some research that suggests that those that write about what is happening overcome tough moments quicker than those who don’t. So write a lot and write every day. The "art" of writing use to be the only means to correspond with others. Letters from the past are full of rich detail, stimulating conversation, and intellectual insight. We often forget that people would write letters to loved ones and not receive anything back for months. A ridiculous notion in this day and age of instant messaging and video conferencing. But consider how you would write a note if you had to capture all your concerns in this moment for someone who would read them in the distant future? How does one keep the note relevant? The answer was to keep the note sincere and personal. Not simple. Not short. For all our advantages, we have lost touch with the permanence that can come from writing. We talk in meetings, send emails, and type text that express ideas, but they do not stay. I can go to a museum and read the letters of poets and politicians long dead, but I will never be able to remember what yesterday's trending tweet was. We have lost, in a sense, a bit of ourselves when we stopped licking stamps and making trips to the mailbox on a daily basis. Part of who we are does not go into our electronic messages, but we once poured ourselves into our letter. Romantics added a dab of perfume to hint at deeper love than what could be communicated by words. Even then, people knew that letters could not convey all they wished to share. Writing is good for all the reasons you noted above, but I would like to add one more. Writing slows us down, takes us out of the loop, and sets us aside. The world is a rushing river and taking the time to write, be it in a journal or only a few thoughts, is a brief respite on the river's shaded banks. You have posted very interesting thoughts here. I couldn't agree more with you. "Slowing down" is undoubtedly another great benefit of writing. That is a topic that interests me a lot these days (I often write about it on this blog).